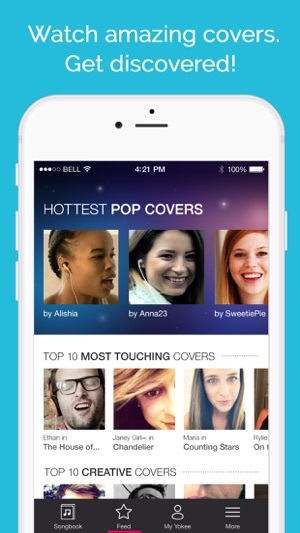 Yokee™ is the #1 iPhone app that lets you and your friends to sing karaoke for FREE. Now available in a totally redesigned iOS 11 experience. Over 90 Million users are already using Yokee™! Wanna know why? 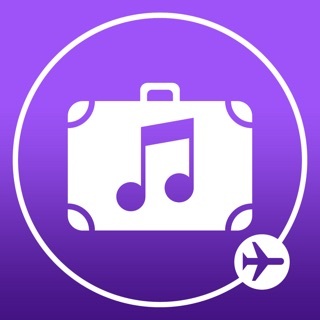 - With Yokee™ you can always sing for FREE from an unlimited library of songs and videos. - Songs in any language – new FREE content is added daily! - You can also search for more songs in our huge library of your favorite artists, genres and themes. Your voice is auto-enhanced with echo and a little reverb, so you’ll always sound great. You may also choose to enhance your voice with our special voice effects like CHORUS, RADIO. * Video recording feature is currently available only for part of our catalog. 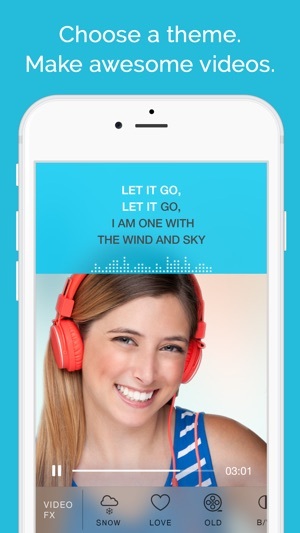 - You'll be able to sing any song as well as record, save and share as much as you like. Connect with Yokee™ on Facebook at https://www.facebook.com/yokeekaraoke to meet other Yokees, request songs, get your performance featured, and more! Join #ValentinesContest for a chance to win a dream vacation. We'll be adding a new contest every month. Stay Tuned! So..... this app is all about a V.I.P pass. You can't do certain songs ( ok I understand that). However you can't listen to your feedback! What's the point of doing it then! I personally don't think I want to waist my money on a V.I.P pass for a game that I don't post my stuff on ( I choose not and I'm not allowed). But seriously come on. I might be sounding a bit dramatic but this is how I feel. Especially after this . So I am excited to ( maybe) have the first karaoke app that works so I can take a video and review my performances for free! No no instead I get the app only to find out I get 2 days worth of free feedback! They didn't say that it just happens and I bet in those two days they hope someone will bye a V.I.P pass! It's also really sad because I got the app and thought it was a glitch so I redownloaded (sorry can't spell) it and I go through the same process so it was a waist of my time and storage! 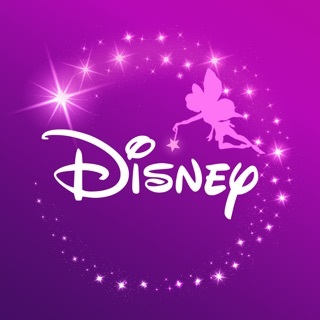 But besides that if your willing to bye a V.I.P pass you should get it but if your like me and either can't or don't want to don't get the app! It's as simple as that sorry this is really long and time consuming but if you read it all thanks and see if this review helps. I love the feed! Smule's feed doesn't automatically play videos when you scroll and it's only from people that you follow. This app is way better with user discovery than it is with Smule. That is the biggest thing that it has going for it. Unfortunately, I don't see myself sticking with the VIP plan. #1 - $7.99 a week or $99 a year is crazy, considering the fact that Smule's offer is $60 per year. They have more users and songs. #2 Song selection - the most important thing. 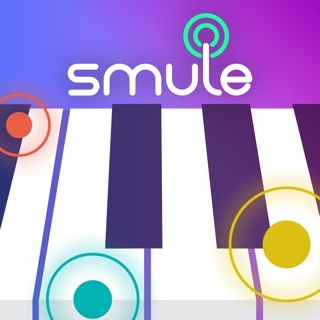 To justify paying more for this app, yall would need to have the song selection on about the same level as Smule's. 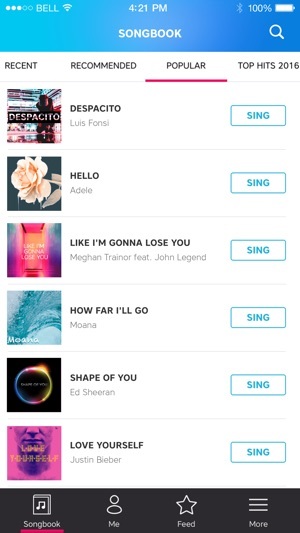 I search for a lot of songs I sing on Smule and 50% of them come up on average if not less. Again this app has the chance to beat the #1 Karaoke app but it’s going need to work on the 2 things I mentioned.